As a small enterprise, it is essential that your company image is consistent. This includes ensuring that your digital communications match your online presence. Your branding or company-specific domain name should therefore also be reflected in your business email address. Many 1&1 IONOS hosting plans include one or more free email addresses in their scope of services. This means that private individuals, freelancers and small companies can all find tailor-made hosting solutions with us. Enjoy convenient storage space and email addresses to match your domain. Create up to 10,000 subdomains and protect your content from unauthorised access. Simple setup and expert support around the clock are also included. Register your domain in just a few steps. In contrast to many free e-mail addresses providers, 1&1 IONOS offers you a wide range of services included in the price and that you should not do without. Regardless of whether you want to use your digital mailbox exclusively for private or commercial purposes, these services can prove essential and would also be charged for by free mail providers (if available at all). Our tip: Don’t fall for the route that only looks free at first glance! Rather than creating an e-mail address free of charge and manoeuvring through the various inevitable pitfalls, opt instead for one of our custom-fit, advertising-free and permanently low-rate email address offers. You need resources for your mailboxes, website, and all other kinds of web projects. In order to work efficiently, constant availability is essential. Features such as high computing power and real-time synchronisation are crucial - as is sufficient storage for your data. With 1&1 IONOS, you benefit from just the right amount of high-performance cloud storage. Manage your emails directly from your browser; you don't need to install an additional email program or mail app. Retrieving your mail is flexible and can be carried out from anywhere with Internet access, regardless of whether you access your inbox, address book or calendar from a smartphone, tablet, laptop or stationary desktop PC. Simply open your web browser, log in, and you're done. You want a unique and memorable email address with your own domain? With 1&1 IONOS, you don't choose your desired address and domain from a narrow list of pre-set email addresses, but rather design your own email address including your domain completely freely. In this way, you can create a reputable online address - or define several for different roles. Thanks to real-time synchronisation, the data on your devices is always in the same state, whether you access it via smartphone, tablet, laptop or desktop PC. This benefits you not only in your business. Whenever you or your employees change or update something, the corresponding devices also synchronise and you always make business and private decisions based on the current data situation. With 1&1 IONOS, intelligent filter routines automatically protect your mailboxes from spam and dangerous emails. This reduces the risk of receiving phishing emails and Trojans as mail attachments right from the start. With just a few clicks, you can also create your own black and white lists at any time and determine which messages are automatically filtered out in the future and which come from trustworthy senders. It depends. If you set up a free email address with a freemail provider, you may only be able to choose from a limited selection of email addresses. In addition, the provider's branding is usually part of the domain name. If you use such a free email account for business, it looks neither professional nor trustworthy. Always remember, your email address is part of your business card online and speaks volumes about you and your company. At first glance, the free offer may seem tempting. But you should make sure that there are no hidden costs and that you don't pay for the service and infrastructure in other ways. Above all, check whether your inbox is permanently free of ads or whether the provider is using advertising to refinance its offer. In the worst case scenario, these ads can also get sent out to your business partners and customers as part of outgoing emails. You should also make sure that the available system resources will meet your business requirements long-term. Special attention should be paid to usable storage space. If you are expecting to accrue large amounts of data then the storage space should be generously sized. In any case, check the costs associated with additional storage or additional performance so that in the future you can work efficiently with your mailbox requirements. Features such as real-time synchronisation, webmailer and spam protection should not be missed. In most cases it is worthwhile to choose a paid provider with the appropriate product features. With 1&1 IONOS you benefit from tailor-made complete packages at favourable rates and a personal email address with your own distinctive and meaningful domain. In addition, we have a large number of mailboxes in every tariff, which you can assign to your employees or certain roles in the company in no time at all to structure your business communication efficiently. Whether or not a free email address is reputable and secure depends mostly upon the provider. You should therefore thoroughly check in advance whether the provider of your choice has established appropriate security functions, adheres to strict data protection and protects your correspondence and all data from unauthorised access. This also and especially applies if you seem to receive an email address free of charge or as a gift. In addition to automatic encryption, intelligent spam filters should ensure security. Unwanted and dangerous phishing emails and Trojans hidden in attachments should never end up in your inbox. Data centres and servers should be state of the art and secure on both the hardware and software levels. Independent experts should certify this regularly. Backup systems should also protect your data from loss. When it comes to trustworthiness, it's all about external impact. A free email address always contains the brand name of the mail provider. In business correspondence this doesn't look as professional and can leave customers and business partners with a negative impression upon receiving your mail. Of course, your mailbox itself should also be free of advertising - especially in the business sector. Of course. Whether you create an anonymous email address or personalise your email addresses, it's up to you. If you create a free email address with a standard freemail provider, there is a modest variety of domain names to choose from that only ensure a certain degree of anonymity and little individualisation. 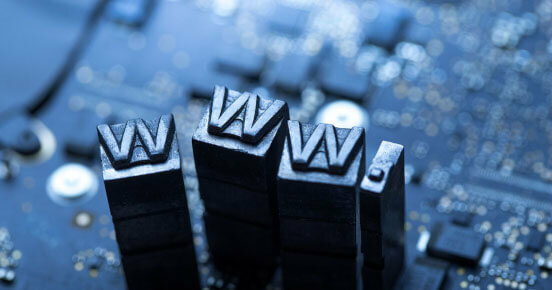 Usually these contain the brand name of the respective provider plus a top-level domain (e.g. .com, .net etc.). In this case, you can only design the front part of the email address, for example with a sequence of letters and numbers or with your name. If you opt for a 1&1 IONOS email address at a tariff of your choice, you will have not just one but multiple mailboxes at your disposal. For each of them you can decide whether you want the associated email address to be anonymous or personalised. In this way, you can map different professional roles onto them and use your email addresses for different communication purposes. In addition, you can design the domain name according to your wishes and needs, for example in the format forename.surname@companyname.com, and without any 1&1 IONOS branding. Yes, a secure and reputable email address is essential for numerous web hosting services. One or even more email addresses are therefore included in several 1&1 IONOS products from the time of booking at no extra charge. This applies to many of our web hosting tariffs, MyWebsite offers and domain packages. We can help bring you and your content online very quickly online very quickly in many ways. Simply choose the right option for you and see for yourself!